Snippets Mini - Front, a photo by jenib320 on Flickr. Mini quilt for my Mom's Birthday! Jane Market Bag, a photo by jenib320 on Flickr. Jane Market Bag for a friend. Winter Scarf, a photo by jenib320 on Flickr. Infinity scarf using Folksy Flannels for me! Today's Haul, a photo by jenib320 on Flickr. A few favorite sheet finds! Oval Elements, a photo by jenib320 on Flickr. Delicious Oval Elements by Pat Bravo. Ready, a photo by jenib320 on Flickr. Ready to sew some summer clothes! Sound of: George running about! - Skype chat with sewing buddies! - Working on my Harry Potter swap with Amanda!! - Finding Nemo, Monsters Inc! - Seeing George bunny after a night away! Holy moses, that Boogie Nights sheet! Love the ovals prints! Pat bravo is pretty much my fabric hero. I am envious of your thrift shop finds!! Somehow, I haven't gotten so lucky with cool vintage sheets. Mostly newer ones...that don't have those fun floral looks or funky colors. In 15 years I will be wishing I had picked up the sheets I am finding now--right?!! PS: I love your mini quilt--great design! Love the oval elements. Love the new pics of George (so handsome!). Isn't it lovely to be home again. There's no place like it. cheers! The quilt for your mom is super,super cute!! Love the orange pillowcase in your faves!! that's a super sweet miniquilt! and i'm gutted with jealousy over your new stashings. oy. What great thrifting finds! I especially love the zig-zag. I absolutely love the fabrics for your summer clothes!!! wow.... now you're just showing off ... you have more projects going on then you mentioned in your last post. haha. i kid. good for you! everything you do turns out so professional and wonderful. my projects always seem a little wonkey. haha. oh, and have you ever done a post about george? does he live inside with you? do you let him run around in your house/apartment. i'm so interested. i had a bunny growing up, but he was an 'outside' bunny. 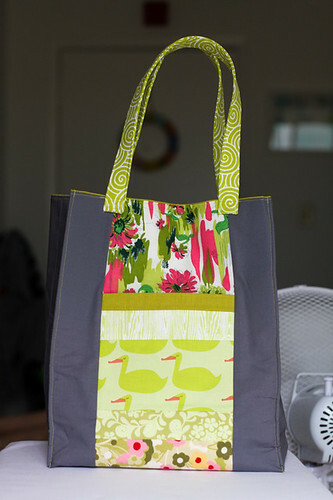 I just love your stack of clothing fabrics, and the market bag is adorable! Hi George!! I absolutely love the pics of George (and your projects). I can just imagine how soft he is!! Is he litter box trained? I have had so much fun thrifting and collecting my vintage sheets!!! I found the EXACT same set of pillowcases as the one pictured at the your stack in the Thrifted Sheets pic in this post!!! They came out of my dryer PERFECT...soft, smooth, and oh-so-vintage!!! How cool is it that from Ohio to Texas we scored the same great pillowcase? !